Almost eight-year-old Elsa is different - a misfit who disappoints her parents and is tormented at school. Her only friend is an outlandish grandmother who has managed to alienate the cast of characters that populate their apartment building. 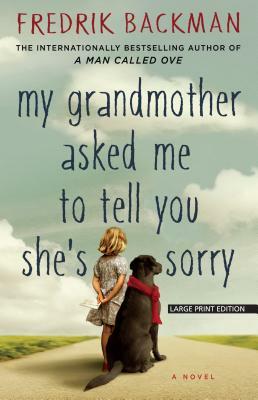 When Granny dies, Elsa learns she is expected to convey at string of apologies on her Granny's behalf. Somewhat unwillingly, Elsa finds and delivers letters via a treasure hunt, following clues that lead her to realize there are others worthy of love who will love her in return. (Be sure to pay attention to the fairy-tales as you read.) Recommended for fans of Roald Dahl and Neil Gaiman. A charming, warmhearted novel from the author of the" New York Times" bestseller" A Man Called Ove." Elsa is seven years old and different. Her grandmother is seventy-seven years old and crazy as in standing-on-the-balcony-firing-paintball-guns-at-strangers crazy. She is also Elsa's best, and only, friend. At night Elsa takes refuge in her grandmother's stories, in the Land-of-Almost-Awake and the Kingdom of Miamas, where everybody is different and nobody needs to be normal. When Elsa's grandmother dies and leaves behind a series of letters apologizing to people she has wronged, Elsa's greatest adventure begins. Her grandmother's instructions lead her to an apartment building full of drunks, monsters, attack dogs, and old crones but also to the truth about fairy tales and kingdoms and a grandmother like no other. "My Grandmother Asked Me to Tell You She's Sorry" is told with the same comic accuracy and beating heart as Fredrik Backman's bestselling debut novel, "A Man Called Ove." It is a story about life and death and one of the most important human rights: the right to be different.